Grandma hasn’t so much got early onset, she has irredeemable, completely and untterly gone onset (if there can be such a thing). 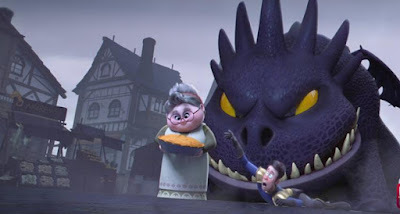 So when a dragon attacks the town she is utterly oblivious while defenders try to save their once quaint abode. But let's face it - priorities are priorities and when a pie needs to be baked it bloody well needs to be baked - and things do get rather ensanguined during the process. Grandma's Pie was created by Camilo Castro and Ricardo San Emeterio at the Ringling College of Art. I have to suspect that Messrs Castro and San Emeterio had perhaps a little too much fun devising the grisly demises of the various brave knights who face the dragon. Bravo, chaps!